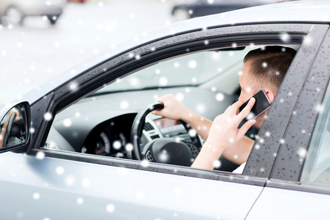 During the holiday season, it’s easier than ever to be distracted while driving. Maybe you’re traveling longer distances than usual to visit family and friends. Maybe you’re experiencing sleep deprivation from the shopping and cooking and decorating. Or, maybe you’re carrying more passengers than usual. Driving is never a time for multitasking. If you feel yourself getting distracted while driving, whether emotionally or physically, pull off to the nearest rest stop or parking lot. To help you stay focused, here are four tips for keeping your eyes on the road. Secure all children, pets and loose gear before you head out. Before releasing your emergency brake, make sure your children are safely secured in their car seats. If they’re old enough, make it a rule — “The car does not move unless you’re belted in your seat.” If a child would unsecure themselves for any reason, get to the closest, safest place to pull off the road until they are secured again. Also, make sure all snacks, toys and any other items the child may want during the trip are within easy reach until the next stop. As the driver, you do not want to be tasked with passing items back and forth. If you have pets, secure them as well, whether by a crate or other form of pet carrier. This is actually a law in some states, including our neighbor New Jersey. This allows you to protect yourself as the driver and prevent distractions should they crawl in your lap, and also ensures your pets do not accidentally hit gear controls or jump out of a window. If ever you are in an accident, securing your pets keeps them safe in the car until emergency responders can get to them. Too often, the stress of an accident causes a pet to run loose in an unfamiliar area. Lastly, keep your belongings secure before leaving the parking lot. You don’t want your coffee cup to roll under your brake pedal. Similarly, if you know you’re going to need something during your travel (e.g. your water bottle), make sure it’s within easy reach. You do not want to be searching for an item or twisting around while driving. Limit your use of gadgets in the car — even safety devices. Your best defense against distracted driving is turning off your phone altogether, or stowing it away so you’re not tempted to glance at calls, texts or emails. While voice-activated controls may keep you from glancing at your phone, phone conversations can still be distracting while driving. Even just getting the voice-activated control to work can be a distraction. So, limit your use of these devices whenever possible. Before leaving the parking lot, dial your call, set your radio station or start playing your podcast. Ask passengers to be respectful of you as the driver. And if they’re not, pull over. Don’t be afraid to ask them to leave the vehicle and get an Uber, a cab or another ride. Some pranksters can take it too far, picking on you emotionally and physically when you’re behind the wheel. Such a situation is not only dangerous for you, the driver, but also for any passengers in the vehicle. It’s not funny. It’s not a game. Similarly, if any passenger unbuckles himself or herself while the vehicle is in motion, you are held responsible as the driver. So, it’s imperative that you remain in control of everyone in the vehicle at all times. Maybe you’re just feeling emotional or stressed by a conversation with someone else in the vehicle. Again, pull over whenever safely possible and talk it out before getting back on the road. When you are mentally distracted, you are not as quick to react to obstacles while driving. Do what it takes to stay awake (or pull off and take a nap). Chew gum. The act of chewing can help to keep your mind active. Bonus: The smell of peppermint can stimulate your brain’s nervous system. Turn on the AC or crack open a window. A cool temperature can keep you from becoming too comfortable. You might also want to take off your jacket before getting in the car. Stay hydrated. Drinking plenty of water also helps to keep your body cool and refreshed. Bonus: It’s even better if the water is ice cold. Talk it out. If you have passengers, keep talking with them. Ask that at least one passenger remain awake with you and keep the conversation going. If you are involved in an accident through no fault of your own, contact KBG for the help you need to get the Results You Deserve®.